I love April Fool's Day! I'm taking today off to play some tricks on my family! I already got my husband. Before going to bed, I had put some Vaseline all over the door knob on the inside on the door to our bedroom bathroom. When he got up this morning for work, he ended up stuck in the bathroom because the door knob was so slippery, he could not open the door! Of course I was laying in bed, laughing away! I am in no way done! I've got the rest of the day! While he's at work, he will notice I changed his ringtones and set his calendar alarm throughout the day! Well I hope you guys are having as much fun as I am today! 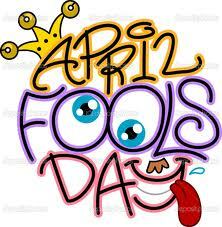 Happy April Fool's!! !